Ducted Air Conditioning | Should You Install A Ducted Reverse Cycle Air Conditioner? What is Reverse Cycle Ducted Air Conditioning? Ducted air conditioning is often regarded as the most versatile air conditioning solution for any home. And it is one of the most popular choices for homes in Adelaide. The reverse cycle ducted air conditioner produces both hot and cold air (hence the term reverse cycle), and is thus perfect for keeping your home warm in winter, and cool in summer. When installed, you will have the ability to direct cooled and hot air to selected zones within your home. This provides the ability to save on operating costs by only cooling the necessary areas. The technology and features of the Ducted air conditioner has advanced considerably over the years. Let’s take a look at some of the highlights of this type of air conditioner. The Ducted Air Conditioner has many innovative features that appeals to a majority of Adelaide home owners. Let’s review some of it’s main features. Being able to produce both hot and cold air makes the reverse cycle air conditioner extremely versatile. Instead of having to install a separate heating solution for the home, home owners can just install one ducted air conditioning system that does it all. This represents significant cost savings as alternative forms of home heating (the ducted gas heating system) could cost as much as $2,000 to install. Unlike Split System air conditioners, which requires a wall unit to be installed in each room that you wish to cool or warm, ducted air conditioning distributes conditioned air via a network of ducts and air vents. These ducts can distribute air throughout a home, and into every room. For this reason, ducted air conditioning is the ideal solution for larger homes with more rooms. In these scenarios, you would require multiple compressors if you wish to go with a Split System. New models of ducted reverse cycle air conditioning come with advanced zoning capabilities. This means you can preset different zones in your home, and configure the climate (temperature, fan speed, etc.) in each zone individually. This allows for much flexibility in terms of controlling the climate in different areas of a home. In addition, ducted air conditioning also has a minimalist appearance. Only the air vents are visible as opposed to the bulky wall units required by split system air conditioning. So if you like a minimalist design for your home, a ducted reverse cycle air conditioner may be your choice. Over the years, the energy efficiency of ducted air conditioners has improved significantly. New models now consume far less power than older models. And with the advent of the “Inverter” technology, ducted air conditioners now feature some of the highest energy star ratings found in electrical appliances. Inverter technology intelligently scales the power mode of an air conditioners up or down, effectively achieving the desired temperature with minimal energy wastage. This means that once your desired temperature is achieved, the ducted reverse cycle air conditioner will scale down to very low power consumption, just enough to maintain that temperature. Ducted air conditioners are easy to maintain. All you have to do is have the ducts professionally cleaned, and the compressor serviced periodically. Split System air conditioning will require all wall units and the compressor to be cleaned. In contract, a ducted air conditioner only has an outdoor and an indoor unit that needs to be serviced. This allows for easier maintenance and quicker troubleshooting should issues arise. Whilst many installers may opt for cheaper brands, with a short sighted approach to simply “win a deal”, Jim’s massive buying power often enables our superior solutions, whilst still maintaining a cost advantage. Our installers will review your floor plans, discuss your personal heating and cooling objectives, and recommend the most ideal air conditioning and heating solution for your home. There are many factors that need to be taken into consideration in order to determine the solution best suited for a home or office. Let our expert heating and cooling consultants provide you with the professional advice on ducted air conditioners to help you make the right choice for your home in Adelaide. Your local Jim is pleased to offer a FREE QUOTE to design and install the right air conditioning solution for your home. Call now on 131 546 or complete the free quote request form on this webpage. We will respond just as quickly as possible, providing our very best service and price. Available on all Reverse Cycle Air Conditioning & Many Other Products! Reverse Cycle Ducted Air Conditioning. All-In Comfort! Ducted reverse cycle air conditioning is one of the most common type of air conditioning. It provides both heating and cooling and is ideal for many home and office situations. Many home owners have opted for this form of air conditioning, as it delivers a complete home climate solution in one neat package. Ducted air conditioners use a network of ducts and air vents to distribute air throughout a home. This allows it a much better coverage than split systems – which requires a wall unit to be installed into each room that requires air conditioning. There are many benefits associated with ducted reverse cycle air conditioning. Below is some information with regards to it’s features, suitability for different home and office scenarios, and how it compares to other air conditioning types. This is perhaps the key benefit of a reverse cycle air conditioning and heating system. It is conveniently the only all in one system available in the market – that provides both heating and cooling to your home. Reverse Cycle means that it can generate hot and cold air, on demand. This is one system that can keep your family warm in winters and cool in summers! Apart from the fact that it performs both heating and cooling, there are also other advantages attached to it’s uni-system profile. For instance, if you are looking at a ducted reverse cycle system, you will only require one set of ducts. Both hot and cold air are cycled in and out of the home with just one set of ducts. This means that you do not need to have a larger roof space to accomodate another set of ducts (which is required if you installed an evaporative cooling plus ducted heater setup). Using just one system to cool and heat your home truly makes it a lot simpler and easier to implement. And with advanced Zoning features that now come with the new models of ducted Reverse Cycle air conditioning and heating systems, you will have full control over your home heating and cooling. Although Toshiba was the first company to introduce the Inverter technology, most top brands today such as Mitsubishi, Samsung and Carrier, all have models that feature Inverter technology. What’s so special about an inverter system? Very simply put, it helps your air conditioning system “scale up” or “scale down” it’s cooling/heating power – according to the preset climate for your home. For instance, if you set your desired temperature for a room to 18°, and your air con thermostat detects that the room is currently at 16° (over-cooled), the inverter technology kicks in to reduce the power and scale down cooling performance. When the room temperature rises above 18°, it then increases the power to compensate. Many consider inverter technology to be like the “cruise control” for air conditioning. This “scaling” allows the system to conserve power and makes it a lot more efficient than other systems without the technology. See the image above for a quick explanation of how inverters work. Most ducted or split system reserve cycle air conditioning systems come with inverter technology. Hence, a reverse cycle air conditioning and heating system can be quite economical to run, although it does consume more power than say an evaporative system. Reverse Cycle air conditioning can come in two forms. Split Wall Systems and Ducted Systems. The Split System Reverse Cycle comprises of a central compressor, with wall units or fan coils installed into each room that you wish to cool or warm. New models of reverse cycle air conditioning have sleek and slimline wall units can be quite aesthetic in nature. Adding to the overall design of the room. Ducted reverse cycle air conditioning do not require wall units. Air is distributed throughout a home via air vents that are built into the ceilings and walls. This makes it the most unobstrusive design for air conditioning. An indoor compressor unit generates the cold or warm air and blows it through these air vents. All recent models of ducted reverse cycle air conditioning comes with advanced zoning controls. You can divide a home up to 8 zones, and set a different climate for each zone. Each zone’s climate can be controlled with a wide selection of presets. These include temperature settings, power modes, timer functions, air flow settings, and many more. The benefit of zoning control is that you can individually set the climate for each section of your home. And turn on and off the air conditioning in only that zone or a few others. This translates into cost savings and a more customised level of comfort. Each system comes with an extensive set of user settings that can be controlled via an advanced remote controller. From various operating modes, to zoning, to climate controls, as well as timer functions, each Braemar air conditioner gives the user ultimate control over their home heating cooling. The Reverse Cycle air conditioning and heating system is a good option for any home during winters. However, you do have other home heating options. Such as evaporative cooling, central gas heating, wall furnaces and wood heaters. Let’s look at how reverse cycle air conditioning and heating compares with each of these. An evaporative cooling system uses “evaporation” to cool air – by running warm air through wet cooling pads. It doesn’t quite produce the cold and crisp air that a refrigerated system (like the reverse cycle air con), but it can be a lot cheaper to run. Since it doesn’t require refrigeration. The downside when compared to reverse cycle air conditioning is, evaporative cooling systems cannot produce warm air. Hence, it does not provide any form of heating in winter. You will need to install a separate gas heating system or heaters, which is a totally separate cost. And, you will need to have two sets of ducts if you are going for a ducted gas heating system in addition to evaporative cooling. The ducted gas heating system is another popular choice of home heating. Like ducted reverse cycle, ducted gas heating distributes hot air throughout a home via ducts and wall/ceiling vents. Again, this system does not produce cold air. Hence, it can only be used for heating and not cooling. Another downside to this system, when compared to reverse cycle air conditioning, is that you have to turn on the whole system, even if you are heating only one room. In contrast, a reverse cycle air conditioning and heating system can be zoned, allowing you to conserve power when cooling or heating lesser rooms or smaller areas. These are great for heating certain locations at home. Like dining or living rooms. However, it just would not make economic sense to install a wood heater in every room. Hence a reverse cycle central air conditioning and heating system would still be better than these other heating options. There are many brands of reverse cycle air conditioning and heating systems in the market. From the more premium priced ones like Mitsubishi Electric, to Toshiba & Carrier, to Samsung, one would be spoilt for choice. The fact is, today’s reverse cycle air conditioning and heating systems have all gone through years of refinement and technological advancements. this means that no matter which brand you choose, you will get a good quality system. There are some specific considerations when determining which brand to go with. And we have covered those in a previous article. Check our blog for that post. Need a good deal for a reverse cycle air con? 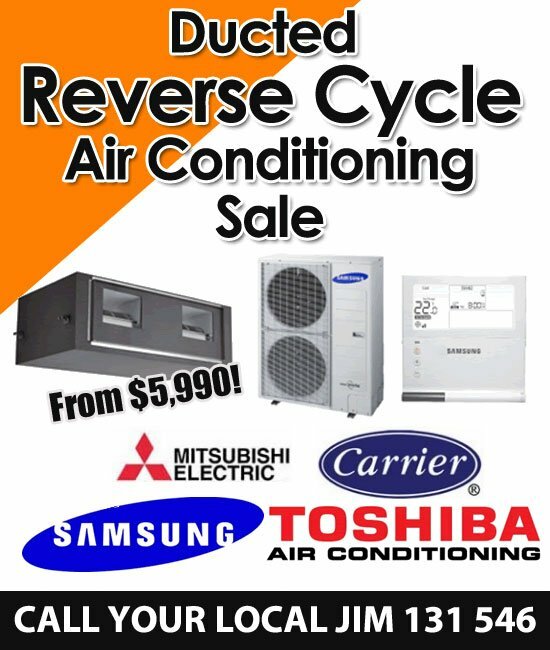 Click the banner below to view the latest reverse cycle air conditioner deals by Jim’s Heating and Cooling. Should You Install Ducted Air Conditioning? Ducted Air Conditioning is usually a good match for any home. It is a very versatile option that can fit most home layouts and requirements. However, there are a few scenarios whereby a Split System or even an Evaporative may be more suitable in a home. Let’s take a look at some factors that should be considered when deciding if a ducted reverse cycle air conditioner is for you. The structure or layout of your home may have a major bearing on which air conditioner type you choose. How large or how complex your home layout is, and whether you have a multi-storeyed home, will determine the most suitable type of air conditioning for your home. Generally, for standard sized single storey homes with 2-3 bedrooms, Split System air conditioning would quite suitable. It is easy to install, and maintenance is straight forward. A wall unit can be installed into each bedroom and one in the living/dining. Normally a single compressor can support a sufficient number of wall units for such a home. Since each unit is controlled separately, you only turn on the air conditioning where it is needed. All in all, a very ideal scenario. However if you have a larger, multi-storey home, with a more complex layout, a ducted air conditioner may be more suitable. Ducted air conditioning uses ducts and air vents to distribute conditioned air throughout a home. These ducts can be run into any space and room of a home. And they are usually hidden neatly in the roof & wall spaces. For this reason, the ducted air conditioner is ideal for covering those hard to reach areas in a home. For multi-storey homes, especially, the ducts can be run from the roof, down through multiple floors. Providing an all-in-one system. For such homes, split systems would not be ideal. As you would need to install more than one compressor to support the air conditioning for each level of a home, and to cover all the areas in the home. This is another important consideration. Budget is split into two parts : Upfront cost & running cost. Depending on how much budget you can set aside for air conditioning, you will need to scale your options accordingly. In terms of upfront costs, Ducted Air Conditioning typically is more expensive than Split System and Evaporative, with Split System possibly being the cheapest option (depending on how many kW and wall units you go for). When comparing installation costs, it is important to compare based on kW – so you get an apple to apple comparison. When it comes to running costs, both the ducted reverse cycle and split system air conditioners are within earshot of each other. Arguably, the ducted reverse cycle would possibly consume slightly more power given that both the external and internal units need to be powered on even if you are only cooling a single zone. The Evaporative air conditioner is the undisputed winner in terms of low running cost. Since it uses an evaporative process, as opposed to a refrigerating process, it consumes significantly less power (one-tenth!) than the ducted reverse cycle and split system. If long term running cost is your concern, definitely take a closer look at the evaporative systems. This may seem like a small consideration but to some home owners, design and interior decor is critical. For those who prefer a minimalist look and feel in their home, the ducted reverse cycle air conditioner is a perfect fit. Since all the ducting is usually hidden in the roof and wall spaces, the air conditioner is quite literally “invisible”. All that remains visible are the air vents, which are installed “flushed” into the ceiling or walls. This minimalist look accentuates the interior decor of a home. As opposed to split system air conditioners, which requires a bulky wall unit to be installed into each room that requires air conditioning. This is also an important consideration. Some home owners require a separate heating solution for their home. For instance, instead using reverse cycle to heat a home, some owners prefer to install wood heaters, wall furnaces or a ducted gas heating system. There are strong reasons why they might opt for that. One being that the cost of gas is much lower than electricity. If you plan to install separate heating, then you do not need reverse cycle. So the ducted or split system may not be ideal. You may instead go for an evaporative system. An evaporative with a ducted gas heating system may help you achieve the lowest running cost for home heating and cooling. So to decide if ducted air conditioning is suitable for your home, you will need to evaluate all the above. And the best thing to do is to consult with a reliable heating and cooling company.